Modern music sources supply output voltages in the 1.0 to 2.0 volt range as opposed to phono cartridges where output levels are millivolts (0.001) or microvolts (0.000001). It makes sense to design a preamplifier optimized specifically for these modern sources. Our main listening room is equipped with such a unit employing an interesting WWII era topology. The inspiration came from the classic text from the MIT Radiation Lab Series, "Vacuum Tube Amplifiers" by G. Valley and H. Wallman. This monumental work was completed in 1948 (1st Edition) and resulted in 28 volumes, one of which was volume 18 mentioned above. Each time we thumb through it we seem to find something we missed or previously misinterpreted. Although complete functioning circuits (other than high gain RF amplifiers) aren’t shown, application examples and suggestions are scattered throughout the text. I believe it is currently available in hard copy (4th printing of 1st edition) and there are some of the original texts still available on Amazon and other websites. Chapters 10 and 11 covering frequency selective amplifier design and direct-coupled amplifier design illustrate applications of cathode coupled and differential input stages. The circuits, which are discussed in this paper, have very high input impedance, low output impedance, wide dynamic range, extremely low distortion, response from zero to the megacycles/second range, and input-output transfer ratios very close to or exceeding unity with no phase reversal. They are suitable for many applications. They may be used as grid drivers of high-power output tubes and will supply 100ma or more of positive grid current in such service. They are suitable as isolation stages or buffers, particularly where their extremely high input impedance characteristics are desirable. Their lack of phase reversal together with transfer ratios equal to or greater than unity and their vanishingly small distortion as well as wide dynamic range makes them particularly useful in active electronic filters and frequency selective amplifiers. The circuits to be discussed occupy a somewhat intermediate position between ordinary cathode followers and operational amplifiers. The circuit, shown in Fig 1, is more complex than an ordinary cathode follower, has an output resistance of 5.6 ohms, an input-output transfer ratio of 0.986, and can supply up to 200 ma of positive drive current without excessive distortion. WOW! Perfect. What more could you ask for (if it’s true) in a line amplifier requiring only 12 dB of gain? We proceeded to breadboard multiple versions of the circuits described in the paper. We even added a few twists with MOSFET or JFET transistors where appropriate. 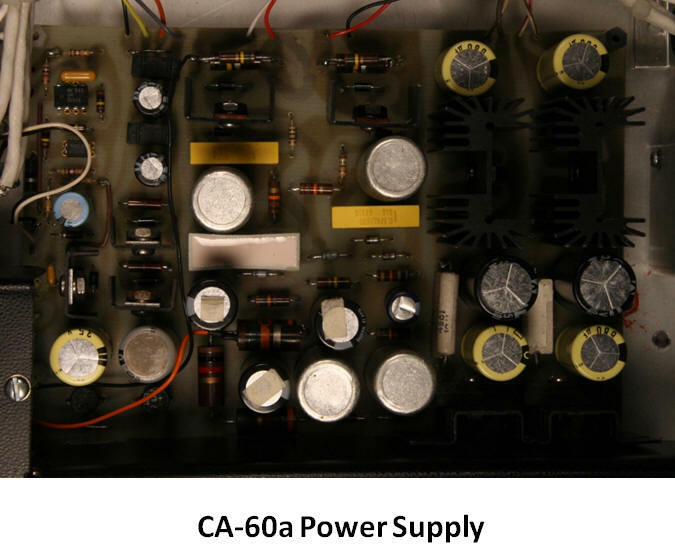 The original CA-60 was all tube with 280V positive and negative rails. It sounded great but was impractical (at the time) to commercialize. Today it would not be an issue considering what the average audiophile preamplifier currently costs! Many incarnations including permutations and combinations of solid state current sources, MOSFET driven plates, MOSFET outputs, and regulated supplies were built and tested. One of the final CA-60a topologies is shown below. It employs a 12AX7 as the input tube (V1a&b) and one-half of a 12AU7 (V2a) as the output buffer. Using all 12AU7 tubes is also possible at the expense of overall gain. Both sounded good but slightly different, so the 12AX7 won out since we have a good stock of low noise matched section NOS units (these were from select stock for an analog computer). As usual, one objective was to use common, relatively inexpensive tubes. The input circuit looks like a standard differential input stage at first glance with C1 and R1 defining input impedance and low end roll-off. Plate voltages are matched by making R2=R3, however capacitor C2 bypasses the AC signal to ground forcing V1a to act as a cathode follower in AC terms. This feeds the second tube V1b via the cathode, leaving the grid as a feedback input. Several versions with separate regulators and driven plate via an integrator were tried but this simple arrangement was sonically equal. Output cathode follower V2a is DC coupled from the plate of V1b. Both the input and output stage have current sources made up of Q1-R4, and Q2-R5 to increase linearity. Diodes D1 and D2 along with bias resistor R6 form the voltage reference for the current sources. The feedback network composed of R7 and R8 defines the gain. Output capacitor C3 blocks DC from the cathode of V1b. It is possible to choose components to allow DC feedback directly from the cathode of V2a but that limits the choices of both open and closed loop gain. All capacitors are polypropylene or polystyrene while resistors in the amplifier circuit are either 1% metal film or 1% wire wound. Some carbon composition resistors were used in the power supply. The power supply employs separate transformers for the filaments, B+, C-, and delay circuits. Individual high voltage regulators, negative regulators, and filament regulators are included. The delay operates an output shorting relay and controls the standby function. Transformers and AC portions of the supply are fully shielded. 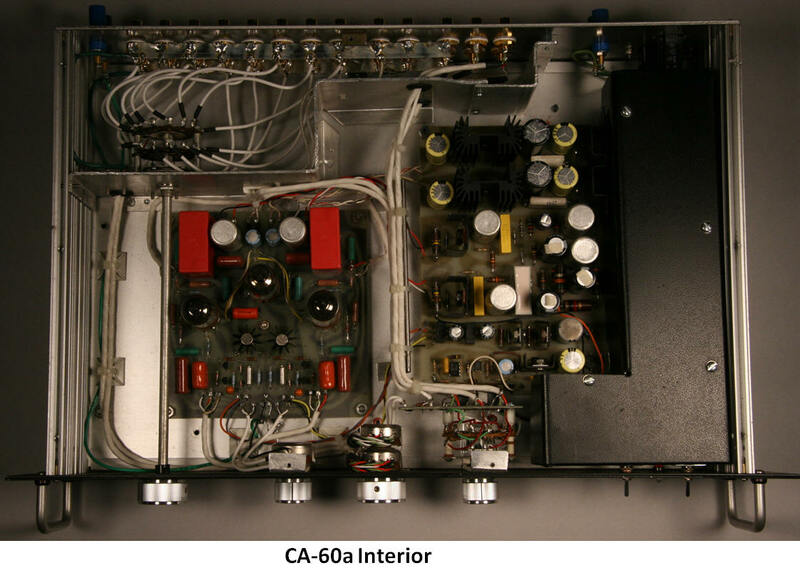 The CA-60a physical layout is shown in the photos below. This version includes eight high level inputs, two for phono stages, and six for normal inputs. 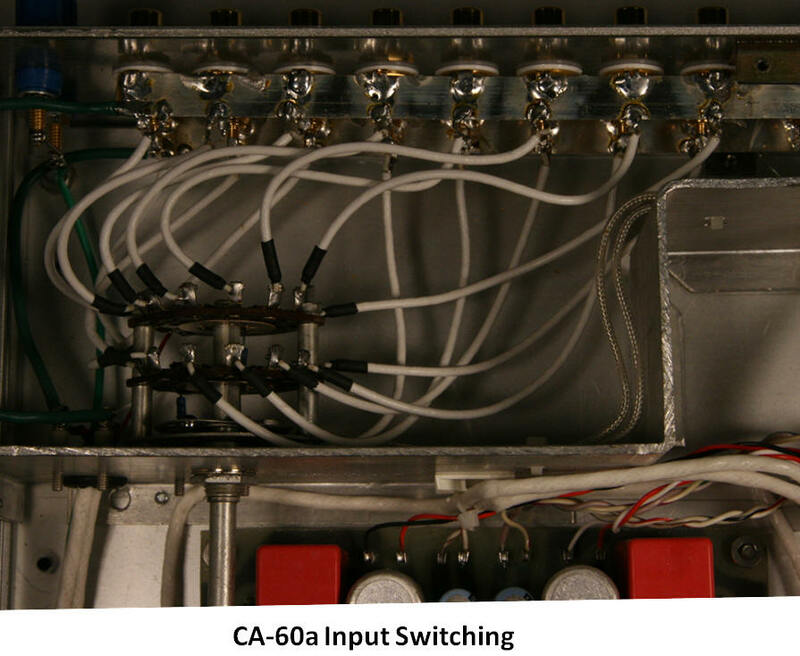 Output switching allows the output signal to be routed to A, B, or both A & B outputs. A direct output is included after the volume and balance controls allowing it to function as a passive “preamp” if desired. This arrangement is very convenient for comparing sources, new preamp circuits, and power amplifiers. Internal shielding of the input and power supply sections reduces noise and cross talk. All power and signal wire is PTFE insulated stranded silver plated copper. THANKS for tuning in and checking out our custom tube gear! CLICK HERE TO CONTACT US IF YOU HAVE AN IDEA FOR A CUSTOM PRODUCT YOU WOULD LIKE US TO DESIGN/ BUILD FOR YOU!!! 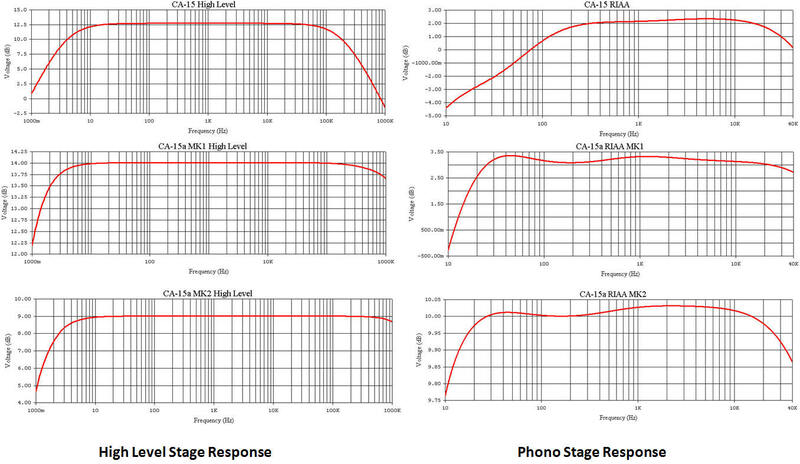 Since we are dealing with microvolt signals and equalization losses, very high gain is required to bring the phono output up to a reasonable level. Unfortunately, the circuit itself contributes noise that is amplified along with the musical signal. Minimizing circuit noise contribution requires high transconductance /low plate resistance tubes, which unfortunately generally have low Mu. Consequently, an additional gain stage or a step up transformer is required for low output cartridges. How can we get more gain and keep the transconductance up at the same time with out resorting to parallel tubes? Some of the older Tektronix oscilloscopes used a low noise JFET input placed in series with the voltage gain transistor in a “totem pole” configuration. Replace the transistor with a triode and you have a high performance hybrid input stage. Note that the input is not a cascode since drain resistor R2 fixes the gain of the JFET, which then directly couples into the cathode of V1a. A voltage divider made up of R3 and R4 sets the JFET operating voltage. As it turns out, a 6DJ8/6922 combined with an SK170 (the classic low noise FET used for decades) provides a good balance between noise and gain. Nothing new here, many tube and solid-state circuits use the same technique (we happened to have hundreds of FET’s in stock!). Placing the RIAA equalization network after blocking capacitor C1 allows the use of low voltage precision capacitors for C2 and C3. Capacitor C1 now enters into the EQ design, so its value is also important. Capacitors C1 through C3 are metalized polypropylene selected to a 0.2% tolerance. Resistors R6 through R8 are metal film selected to 0.1% tolerance. The RIAA design included approximation of stray capacitance, inter-electrode capacitance, and stray inductance. Many people ague that splitting EQ between stages is better than a single network. Maybe, but we chose to isolate the EQ network from output loads. Adding an output buffer would allow splitting the EQ and isolating the network but would require another tube. We do indeed split the EQ and redistribute gain in our reference phono stage but is substantially more complex than this circuit. Output coupling capacitor C4 is metalized polypropylene and all other resistors are 1% metal film or wire wound. Keep in mind the schematic is a topological illustration only, supporting circuitry is not shown. Overall gain is about 56dB @ 1 kHz, which works well with our Dynavector high output moving coil cartridge. The gain was lowered to about 50dB for the Soundsmith VPI moving iron unit. THD is 0.03% @ 15mVp input. Theoretical and measured frequency responses are shown in the graph, not bad for such a simple circuit. Sonically it is very pleasing with virtually no fatigue after hours of listening, midrange presence is outstanding when used with the Dynavector or Soundsmith cartridges. It performs particularly well with classical music but has plenty of punch for rock and roll. We have found that a good power supply can make or break any audio circuit, perhaps that’s why this circuit seems to perform so well. The power supply is our usual twin transformer arrangement with power and standby switches placed on the line side. Full magnetic shielding of the AC section and the delay circuit (which has its own power transformer) is incorporated. Filament and plate supply voltages are derived from standards silicon rectifiers with resistive and capacitive snubbers. Polycarbonate bypass capacitors are place across the electrolytic filter capacitors in both supplies. 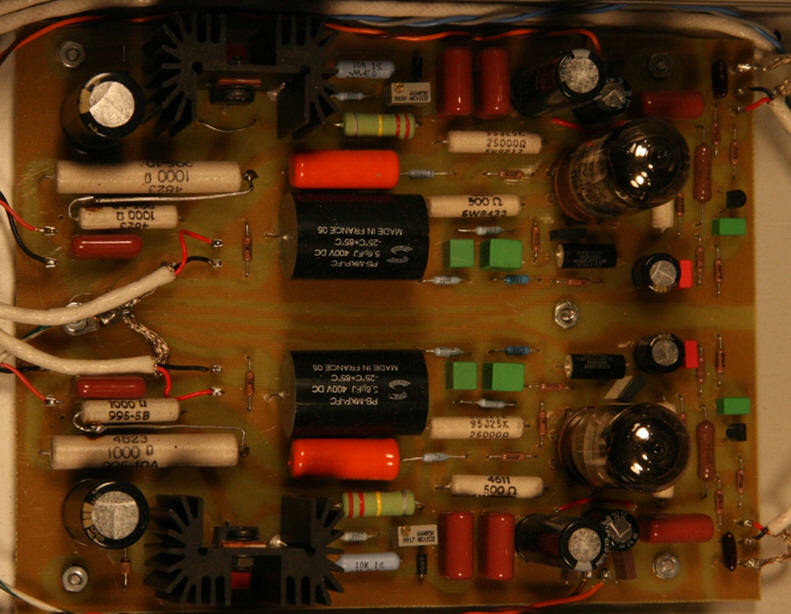 Sub-circuit PCB’s carry the rectifier and first stage filter capacitors to keep the main power supply board compact. Regulated +260V and +6V are supplied to the phono board. Each channel has a dedicated High voltage shunt regulator based on a high current low noise topology developed for driving high voltage bridge sensors in an aerospace application. 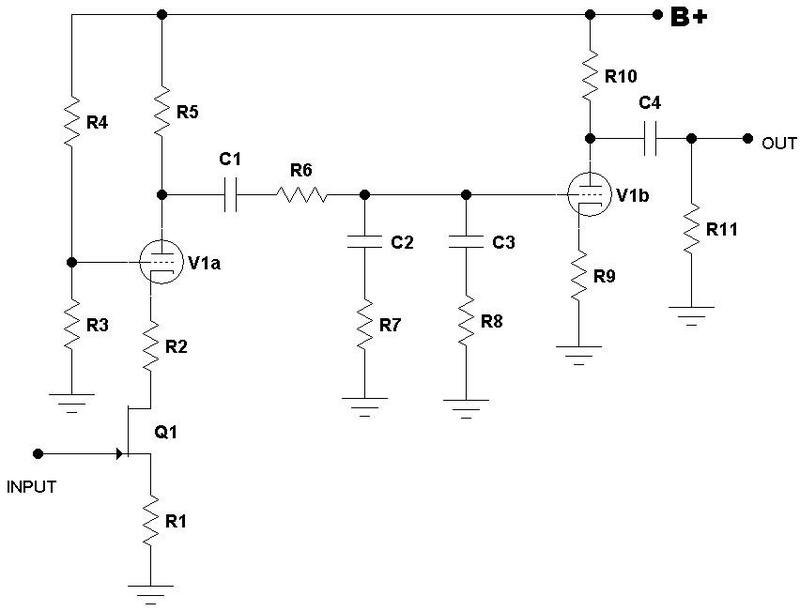 Local shunt regulators have been used for decades in many transducer applications where PSRR is critical. Recently I was informed that Vacuum State electronics has a similar design, as does Sonic Frontiers. Cool! That means I’m on the right track. Often circuit designers end up at the same point although they started with different objectives, apply different methodology, and have different knowledge bases. Most of my inspiration comes from classics texts, handbooks, and old transactions of the IRE from the 50’s and 60’s. Most of the “new” or even patented vacuum tube circuits can be found in the classic text “Vacuum Tube Amplifiers” by Valley & Wallman. I also adapt many of the techniques I have employed in instrumentation and low noise electronics design. We have also been chastised for ruining the tube sound with solid state devices in the signal path yet no one has been able detect the “contaminated” circuit in listening test. In fact, every subject preferred the JFET circuit to a similar pure tube topology (standard MM cartridge was used to allow gain matching between circuits). That's it for now but stay tuned for more custom components from YFS! First, let’s keep in mind that this is not a dissertation on vacuum tube amplifier design, nor was this an attempt to produce a top notch audiophile preamp. 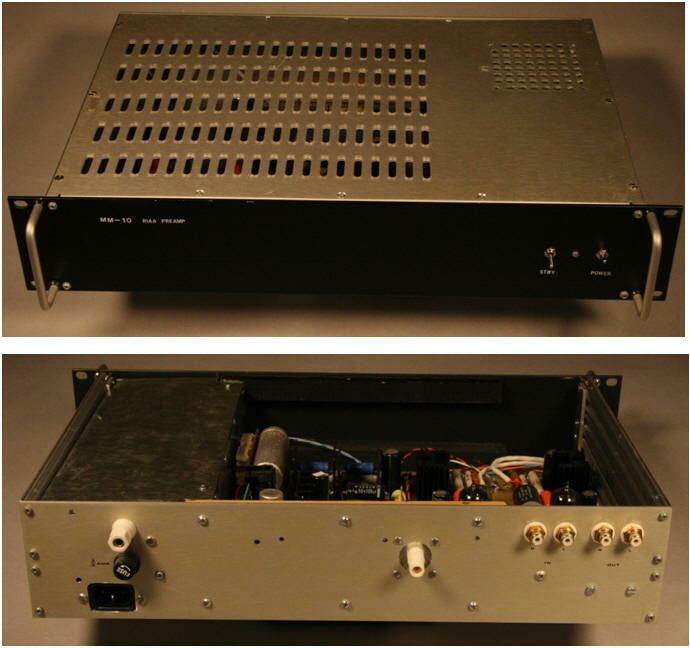 We are describing the evolution of one of our custom preamps. If you are interested in circuit design there is a myriad of books and articles available (or drop us a line for specific questions). Through the years five units with various chassis designs (customized inputs, outputs, and controls) were built, and several were upgraded. 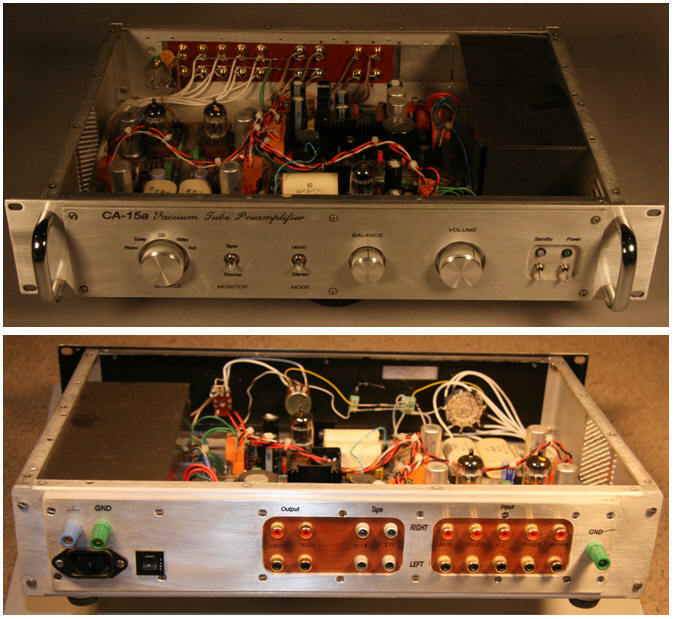 The CA-15 started in the late 80’s as a test bed for vacuum tube preamp designs. Our circuits were common topologies with obvious sonic limitations but the idea was to start with a “classic sound” and incrementally improve upon it. Simplicity was the key. What does a simple circuit sound like? We were pleasantly surprised, it wasn't world class but it was much more open and realistic than several respectable solid state preamps we tested. Through the years, pretty much at random, we tweaked the design to improve performance (usually as a break from other extended development projects). 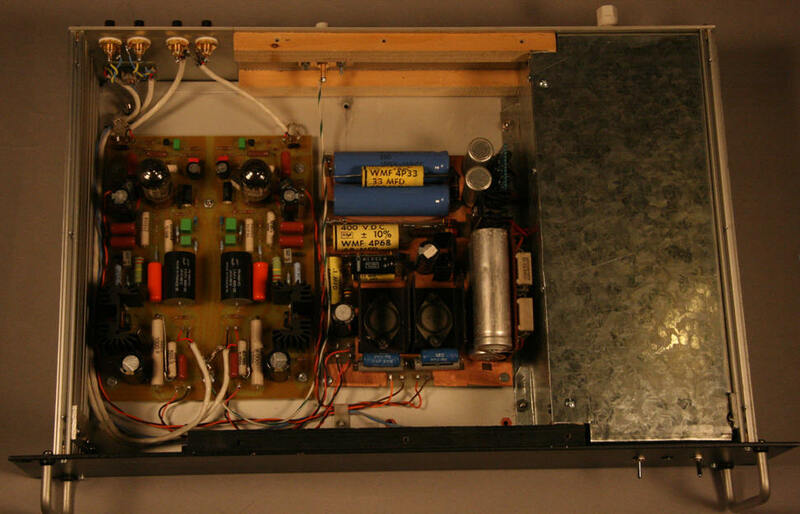 Each section of the preamp (power supply, high level, and phono) was an optimized version of a classic topology. A suite of switched inputs, direct output (after the volume/balance), high level output, a tape loop, and a mono switch were included. After many modifications, stints in dorm rooms and apartment moves, the unit is pretty beat up but is still working just fine. As a matter of fact, modified versions of the original PCB’s are still functioning in one of our first customer’s preamps! Remember that the objective was to see how a simple “classic” topology built with modern components would sound. It was used as a reference for evaluating upgrades and new topologies. As it stood, many jaws dropped when paired with solid state class A output power amps, especially with vinyl as the source. Compared to solid state and IC preamps of the time, the midrange detail and smoothness was startling. It did lack the bass punch and high end sparkle associated with top solid state and tube preamps of the time. To no one’s surprise it didn’t stand a candle to the old SP-11 (I’m convinced the 11 stood for number of tubes in the unit)! With limited bandwidth and a relatively soft power supply one can’t expect the world. The power supply was a simple all solid state design using standard rectifiers and electrolytics with metalized polycarbonate film bypass capacitors in both the filament and high voltage supplies. Capacitance multipliers provided reasonable L and R channel isolation but there was no regulation per se. As in all our designs, separate filament and high voltage transformers were employed to eliminate any switches in the secondary circuits. The standby switch allowed tube filament to be warmed up before applying high voltage. A delay/standby circuit was also powered from the filament transformer. 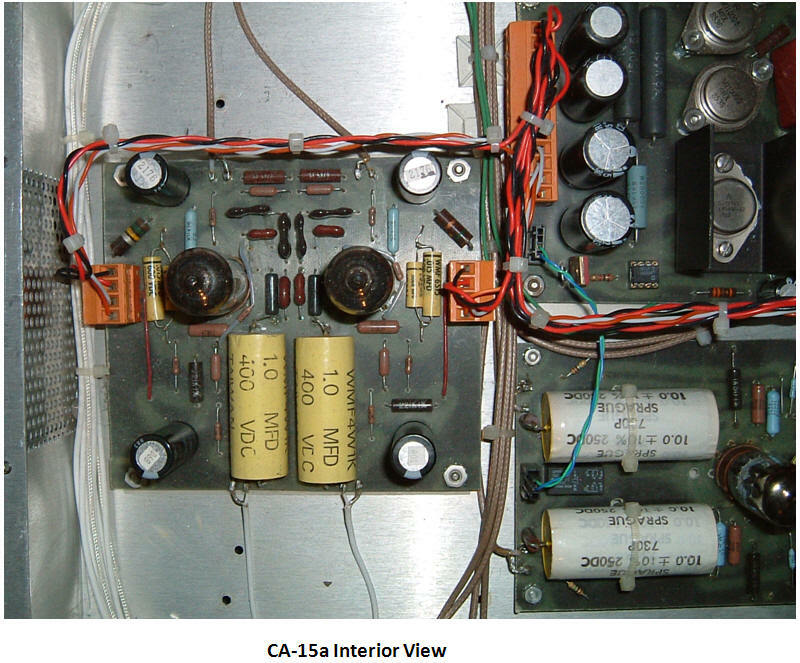 Although the version shown sports a magnetic/electrostatic shield over the power supply transformers and AC section, the original CA-15 was open with the transformers oriented for minimum hum. The high level circuit was a simple 12.5 dB gain Mu follower built around a 12AU7 with 100K input impedance and metalized polypropylene output blocking capacitors. Outputs were shorted by a timer operated relay allowing the high voltage to stabilize before connecting to the power amp (no pops due to DC offsets). Both carbon film and carbon composition resistors were used. 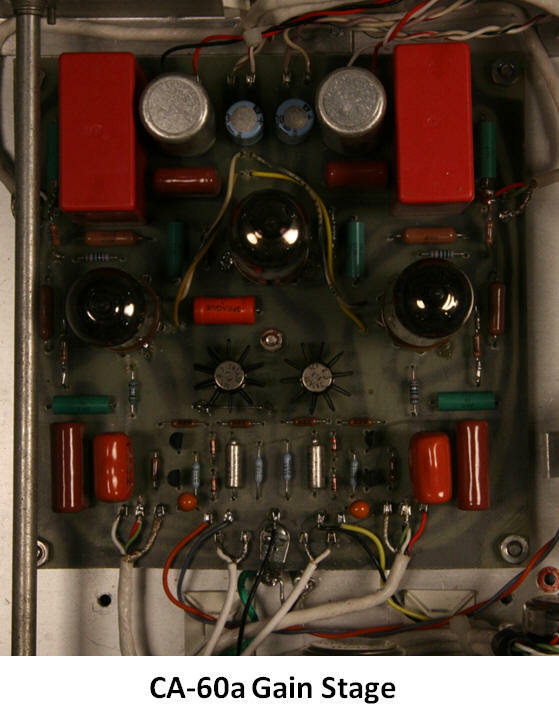 The phono stage was a classic 12AX7 two stage cascaded triode topology with bypassed cathode resistors to maximize stage gains. Active global feedback using a simple three element network eliminated issues with DC at the summing junction (cathode of first stage) but only approximated the ideal RIAA response. Feedback network components were 1% metal film resistors but the mica capacitors were only matched to 3%. Midband gain was 42 dB. The next step was to update each sub circuit to more modern topologies, hence the “a”. The input switching made 1:1 comparisons simple. No modifications were made to the power supply for the first iteration, only high level amp and phono section were changed. The MK1 version had identical topology but included extra bypass caps, current source regulator zener string, and closer RIAA equalization network matching. The high level section maintained the 12AU7 but employed a common cathode topology with unbypassed cathode resistors to control gain. Optimizing for minimum THD and dynamic range left us 14 dB of gain, a bit too much. The musical detail and bass response was noticeably better, probably due to the metal film resistors and extra high voltage filter capacitors. Unfortunately the stage had relatively high output impedance, not so good for driving long or high capacitance interconnects. The phono stage retained the basic twin cascade topology but a small amount of positive feedback was achieved by resistively coupling the cathodes. 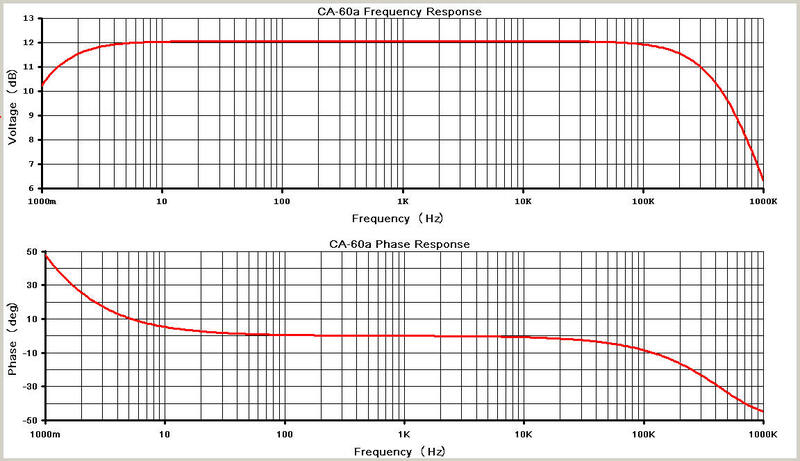 This increased the open loop gain allowing a midband gain of 43 dB and response much closer to the ideal RIAA curve. Mica capacitors in the feedback network were matched to 1% which anchored the sound stage by reduced channel to channel “wandering”. High voltage filter capacitance on the PCB was also doubled. Sonic improvement was immediately noticeable, especially in the midrange, but the bass was loose and the treble region was slightly muted. Everyone thinks I’m being over critical here, but after all, the whole idea was to make significant improvements over the reference topology. Overall, not bad and well worth the effort since it still outperformed the reference and several commercial preamps. One negative was the noise from the phono stage, a common problem when using low transconductance tubes in high gain circuits. The objective of the final phase was to adjust gains to better suite modern sources, i.e. reduce high level stage gain and increase phono stage gain. I chose a hybrid topology where the tube contributed the majority of the gain and local feedback controlled overall stage gain. This is the current incarnation of the CA-15a being used in our lab/listening room. 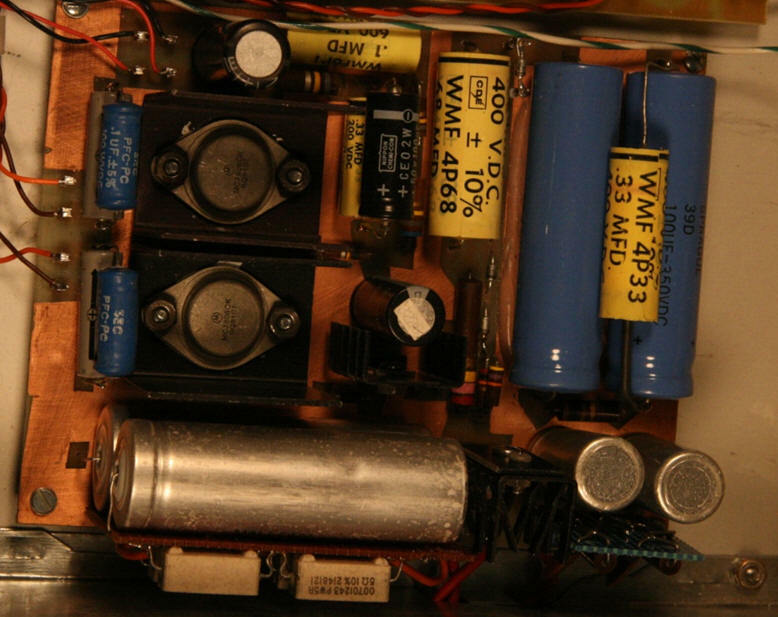 A few simple modifications were made to the power supply which included converting the capacitance multipliers to buffered zener regulation, adding high voltage filter capacitance and polypropylene bypass capacitors, and increasing the high voltage transformer VA rating (doubled the core volume). The hybrid high level stage retained the 12AU7 as the input but the plate is directly coupled to a P-channel MOSFET running at relatively high current. A series of resistors bias the output MOSFET, set second stage gain, and provide feedback to the cathode. Its low output impedance allowed the stage to drive long high capacitance interconnects without loss of highs. Total gain for the stage is only 9 dB, commensurate with the typical DAC level. The passively equalized phono stage employs 0.5% matched metal film and polypropylene capacitors. It is implemented using two gain stages similar to the above topology. High input impedance and low output impedance are real advantages in this application. Lower resistor values for RIAA network (lower noise) can be selected without loading down the input stage or causing nonlinearity operation. Higher open loop gain allows accurate equalization over an extended frequency range (10Hz to 40kHz). Keeping the 12AX7 and directly coupling the plate to a MOSFET provides a midband gain of 50dB bringing the phono output to nearly the same level as a DAC through the high level stage. The more accurate RIAA equalization evens out the response and extends the bass and the treble regions, bass response is much tighter also. Overall sound was open and accurate but that “magic mid” was less apparent. Could a less accurate EQ sound better (it is a matter of taste)? This final design remained a reference preamp for many years. 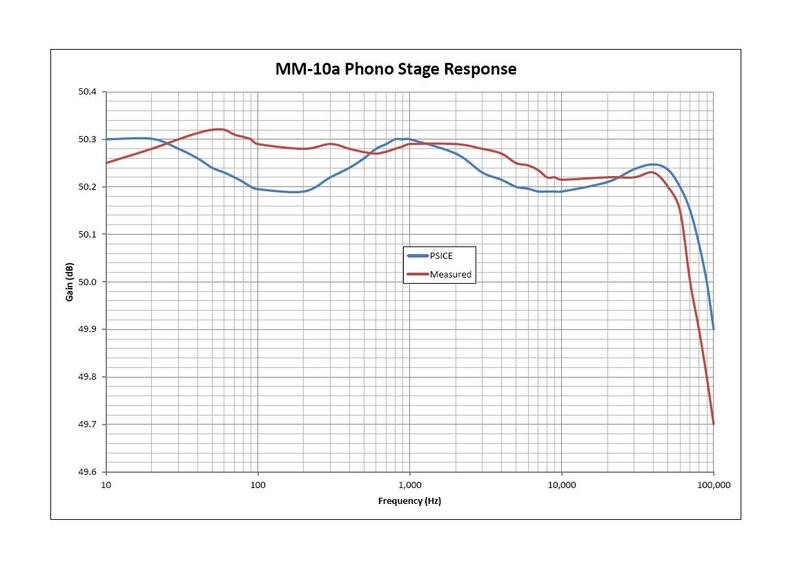 To make an “apples to apples” comparison we used PSPICE models to compute amplitude response of the high level and phono stages (phono is deviation from standard RIAA curve). This allowed us to eliminate effects of tube transconductance and component tolerance. Actual response for the CA-15a MK2 design are also shown. Interestingly enough, the old MK1 version is sonically equal or better than several currently available tube preamps. We hope you enjoyed our break-down of our classic custom preamp. There have been multiple questions regarding the topologies described in the article. Here are the basic schematics showing the functional components for each revision (no supporting circuitry). 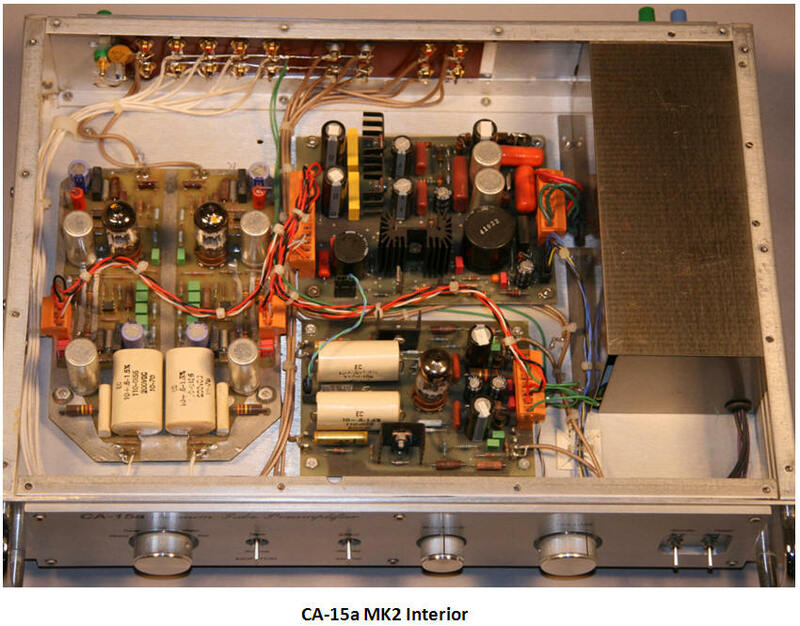 The CA-15a phono and high-level topological schematics are shown below. 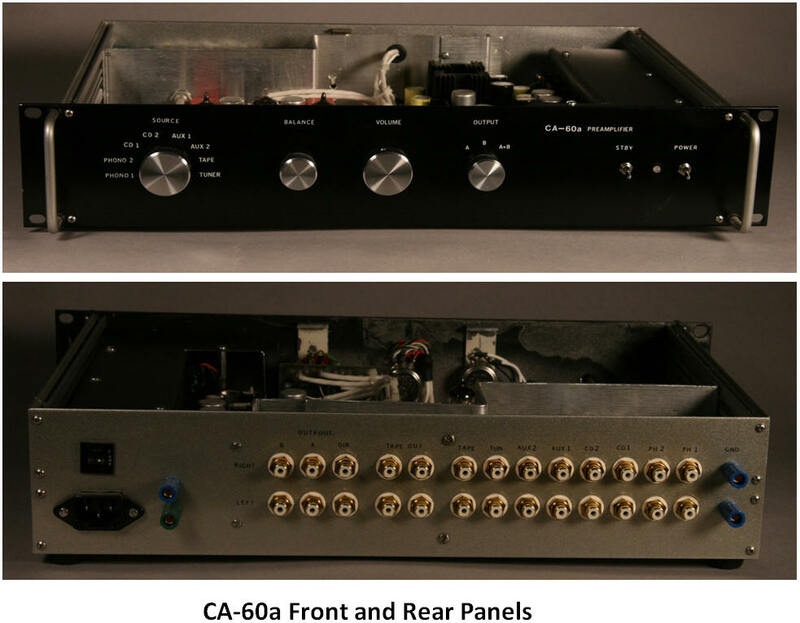 The original CA-15 is illustrated since the CA-15a is topologically identical, the differences being the power supply and the RIAA network values. The first stage of the phono circuit uses triode V1a in a standard common cathode arrangement with its gain defined by cathode resistor R2 and plate resistor R3. Blocking capacitor C1 and grid resistor R4 form the input circuit of V1b (also a common cathode arrangement). Notice the second stage has a bypass capacitor C5 across the cathode resistor R8 to maximize gain. The RIAA compensation is achieved by a feedback network made up of C3, C4, and R7, which returns to the cathode of V1a. 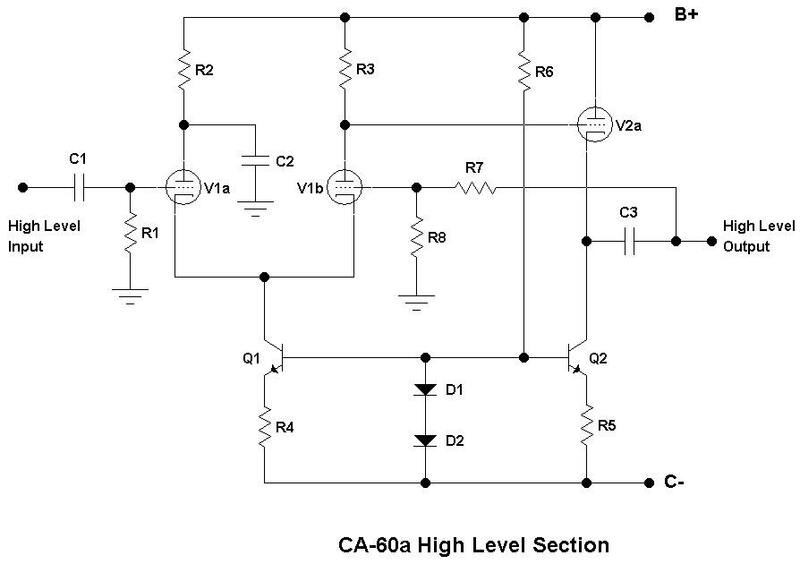 Effects of output block capacitor C2 on the RIAA response is eliminated by placing it after the network. This is possible because C4 blocks DC from the plate of V1b. This was a popular circuit design for many old HiFi systems since it has minimum components count and was relatively simple to design. Most sonic differences stemmed from varying the gain ratios between stages and RIAA accuracy (although RIAA accuracy on many recordings is questionable to begin with). The high-level stage is an inverting Mu follower built around a single section of a dual triode. Gain is maximized by bypassing cathode resistor R2 with C5. Plate resistor R3 is optimized to provide maximum gain with the lowest possible output impedance since it must drive the feedback network and the load. Feedback network made up of R4 and R5 sets the gain and input impedance. Why didn’t we add a cathode follower at the output of each stage? Well, 95% of the DIY and commercial tube amps (Dynaco, McIntosh, Marantz, etc.) use that topology. We are experimenting with simplicity. The challenge is using only three dual triodes for an entire stereo preamp. Looking at the MK1 schematic it is obvious that the phono sage is essentially the same as the CA-15a other than the addition of feedback resistor Rpf between cathodes. This arrangement provides a small amount of positive feedback, increasing open loop gain. This may very well be the reason for the openness and sweat midrange typical of this circuit. Optimization is a bit trickier since extra poles and zeros now show up in the transfer function. The more obvious change is in the high-level stage where the Mu follower is converted to a simple unbypassed common cathode with gain determined by R2, R3, and the mu of V1a. John Broskie has a variation that includes a cathode follower available as a kit. We have built many versions of this circuit and it does sound very natural! I highly recommend John’s Tube CAD Journal as a source of basic theory and some great new design ideas. I have only recently discovered the website, and I have to say, it is one of (perhaps “the”) best site on vacuum tube design I’ve seen. He also sells parts and kits for most of the circuits described in the articles making life easy for the DIY'er. I digress, back to the discussion at hand. We cheated with the MK2 topology, still only three dual triodes, but we added a MOSFET for extra gain, and applied feedback. This circuit grew out of work done on interfacing custom feedback transducers. The original circuit used a JFET input device directly coupled to the MOSFET and a driven shield. Replacing the JFET with a vacuum tube was obvious. All stages are built around this basic configuration but actual component values vary from stage to stage. Design is a bit tricky since R2 and R5 provide global feedback, R5 and R4 set second stage gain, and R2 and R3 set first stage gain (a bit of interdependency, but nothing a good set of equations can’t solve). High voltage is also limited by the Vds of the P channel MOSFET which in turn limits gain available from the simple common cathode circuit. 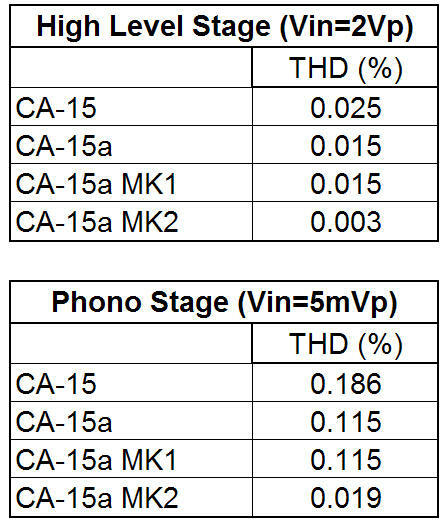 The phono stages run at relatively low current and high gain with a passive RIAA network (C2, C3, R6, R7, and R8) placed between stages. Blocking capacitor C1 allows us to use low voltage EQ capacitors, however the extra pole has to be included in the network design. Hope this answers some of your questions.